Scenic badlands used for the movie set of "Starship Troopers". The viewing area is immediately adjacent to the highway between Casper and Shoshoni. It is worth a stop if you are driving past. 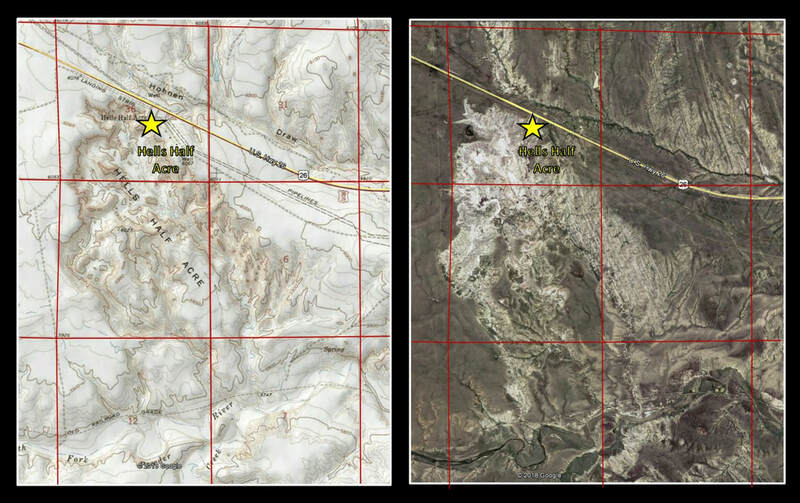 North aerial view of Hells Half Acre (yellow star) and the Casper Arch trending North 30 West. 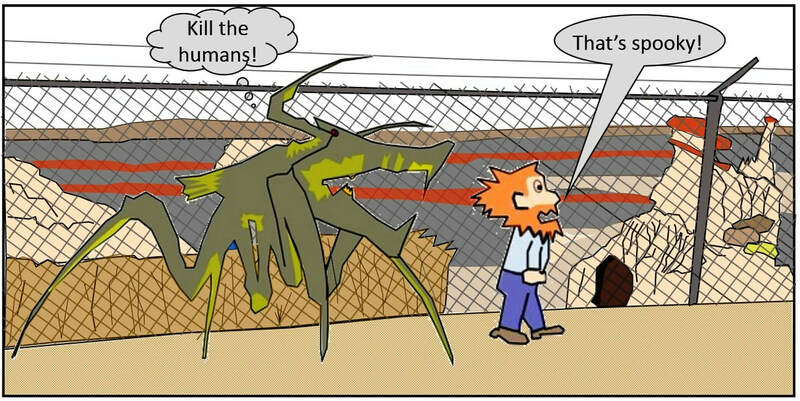 Forty miles northwest of Casper lies an other worldly badland landscape so eerie it was used for the 1997 movie “Starship Troopers” as the set for planet Klendathu, the home of a species of hostile Arachnids. These fictional aliens were colonizing new worlds and were at war with humans for survival. The location set was at a place called “Hells Half Acre” on the south side of U.S. Highways 20/26. The badlands encompass an area of 320 acres (parts of section 6, Township 35 North, Range 85 West, section 1, Township 35 North, Range 86 West, and section 36, Township 36 North, Range 86 West) along the western toe of the Casper Arch. The land was donated by the Federal Government to Natrona County as part of a 960-acre grant in 1924. 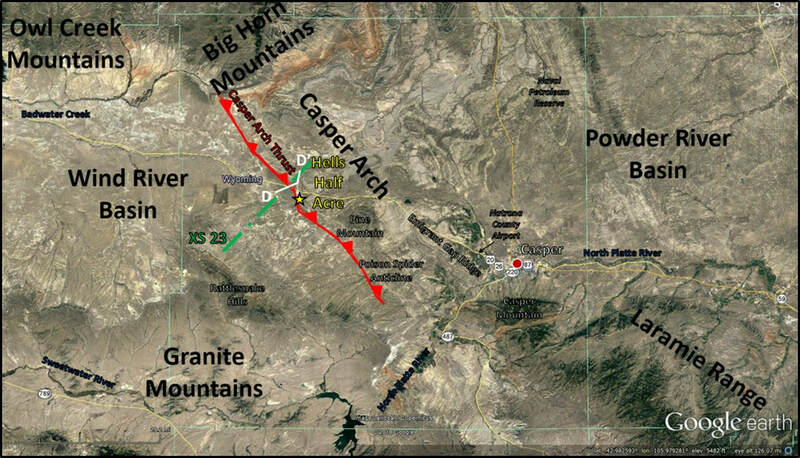 The Casper Arch is one of the major structures elevated during the Laramide Orogeny (70-55 million years ago). 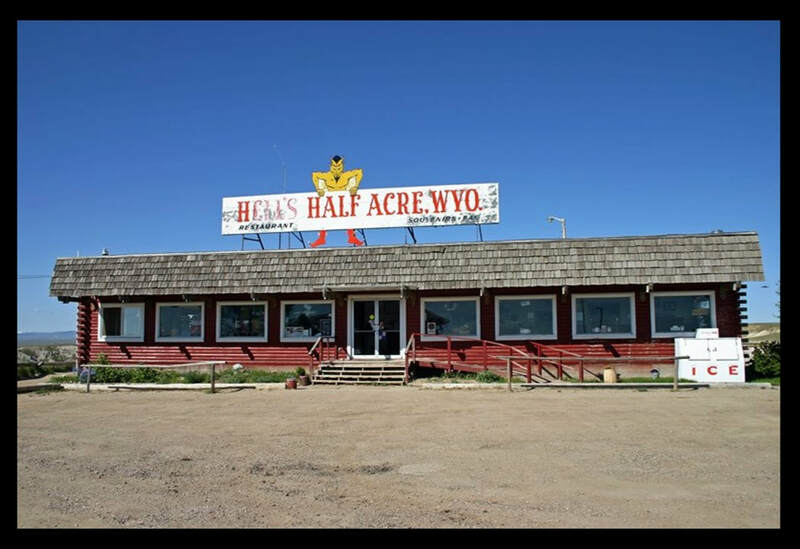 The name Hells Half Acre came from an advertising campaign by boosters in Casper wanting to bring more tourists to the area with a roadside attraction. 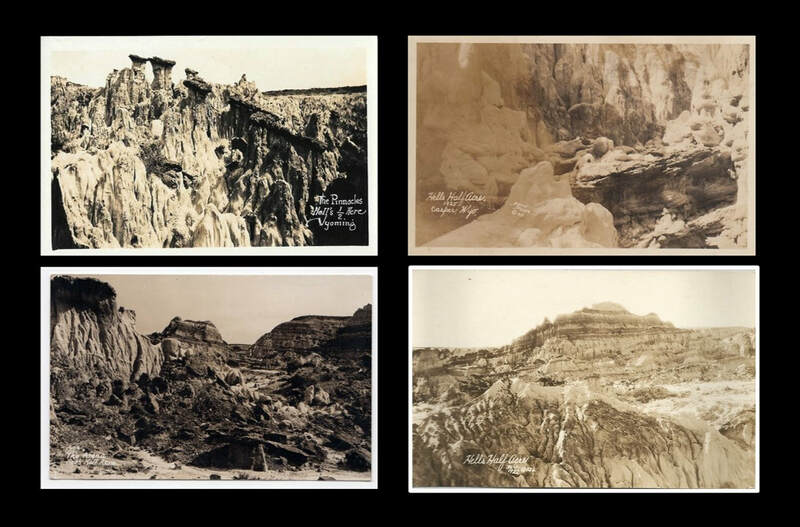 They ordered thousands of picture postcards with the name “Devil’s Kitchen,” but they arrived with the name Hells Half Acre. Not wanting to lose money, the cards were used, and the name changed. 1920s vintage postcards of Hells Half Acre. ​The Restaurant and motel were closed in December 2005 and subsequently torn down. The county fenced off the site. A Post Office was also here from 1940 to 1971. Hells Half Acre in 1947 (top left), circa 1990s (top right), and today (bottom). 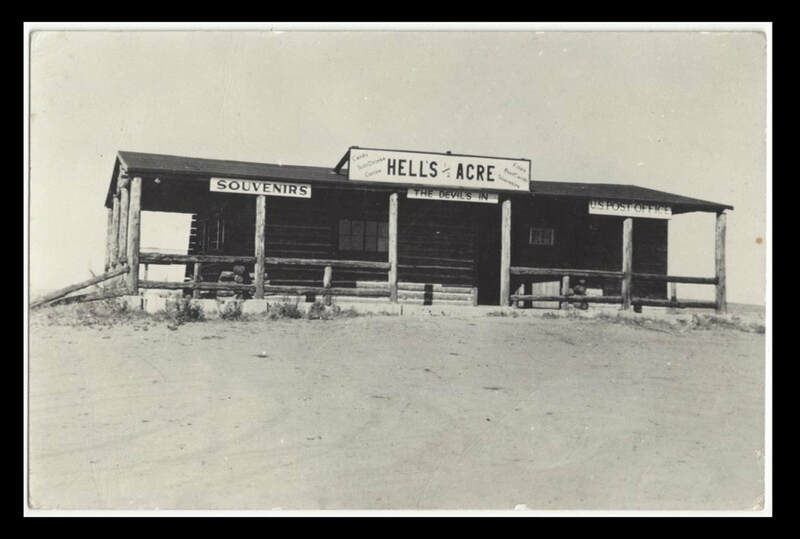 Image: Top Left: https://www.ebay.ca/itm/1947-Hells-Half-Acre-REAL-PHOTO-Post-Office-Store-Vintage-Postcard/372396762090?hash=item56b493a3ea:g:yNoAAOSw7pZbY0Am:rk:6:pf:0; Top Right: Hunt, Dave, https://mapio.net/pic/p-55572678/; Bottom: Google Earth Street View. First day mailing envelope and stamp cancellation from Hells Half Acre. The post office opened in May 1940. Hells Half Acre. The spires, ridges, caves and scarp of the ravine are developed in the multicolored Eocene Wind River Formation. ​Native Americans often used local topography in their hunting strategy. The fall of 180 feet off the rim of Hells Half Acre was a god spot for herding bison over and they used the area as a bison kill site. Bison falling over the rim or trapped in the ravines could be easily slaughtered. A 2006 archaeological investigation by John Albanesefound bison bones and spear points dated as 3,000 to 1,200-year-old. ​The badlands at Hells Half Acre are developed in the Lysite Member of the Wind River Formation. The 150-foot-deep gorge, and the badland features were created through differential erosion by wind, gravity and intermittent streams flowing south into South Fork of Powder River. Lithologies of Lysite Member strata are red, purple, gray, greenish-gray, and white siltstone and claystone interbedded with white, gray, and buff lenticular sandstones. These beds have a pronounced angular unconformity with the underlying Paleocene Fort Union Formation and Cretaceous Lance Formations. An angular unconformity is an erosion surface where the underlying older beds dip at a different angle than the overlying younger beds. This contact relationship and the presence of Precambrian clasts in the Wind River Formation shows the relative timing of major movement on the Casper Arch thrust fault. Angular unconformity between the Lysite Member (Twl) of the Eocene Wind River Formation dip 20 to 30 degrees westward and underlying Cretaceous Lance (Kl) and Paleocene Fort Union Formations (Tf) dip 45 degrees to nearly vertical. Prominent badlands in variegated strata in Lysite Member (Twl) of the Wind River Formation at Hells Half Acre, section 36, Township 36 North, Range 86 West. Arkosic sandstone of Lost Cabin Member (Twlc) of Wind River Formation forms dark band at top of rim and unconformably overlies the Lysite Member. The Cretaceous and Tertiary stratigraphy involved in the uplift of the Casper Arch and exposed at Hells Half Acre is shown below. 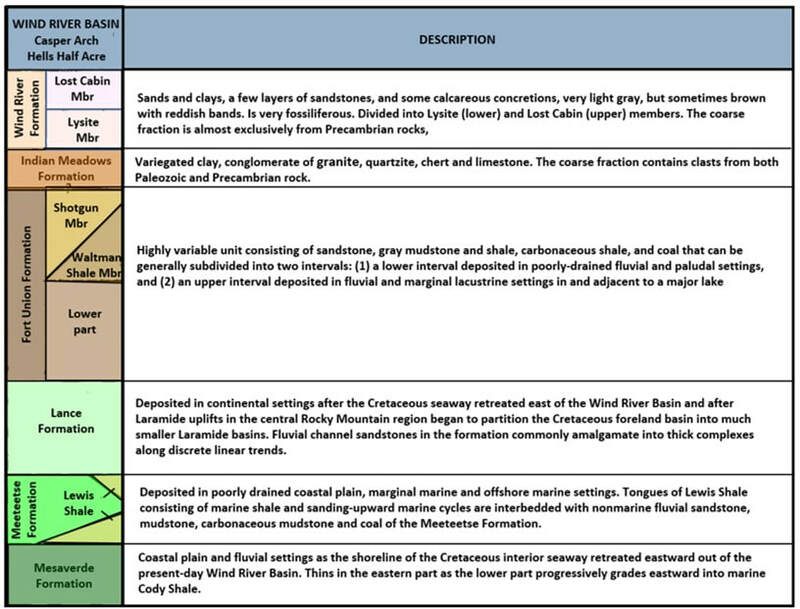 Stratigraphic column for Cretaceous through Eocene Rocks in the southeast portion of the Wind River Basin. Geologic cross section D to D’ (southwest to northeast) displaying the shallow stratigraphy, angular unconformity, thrust fault, and folding on the Casper Arch. Cross section location is shown on the Hells Half Acre-Casper Arch region aerial image. The Casper Arch is the structure that separates the Wind River Basin (west) from the southern Powder River Basin (east). The uplift is bound on the west by an east-dipping thrust fault with 20,000 feet of basement relief on the Precambrian Basement. Image: Blackstone, D.L., Jr, 1990, Rocky Mountain Foreland Structure Exemplified by the Owl Creek Mountains, Bridger Range and Casper Arch, Central Wyoming: Wyoming Geological Association 41st Annual Field Conference Guidebook, Cross Section 23. Seismic line and geologic index map over the Casper Arch at Tepee Flats Field. Tepee Flats Field is located about eight miles to the northwest of Hells Half Acre near the northern end of the Casper Arch and south of the Big Horn Mountains. Image: Ray, R.R. 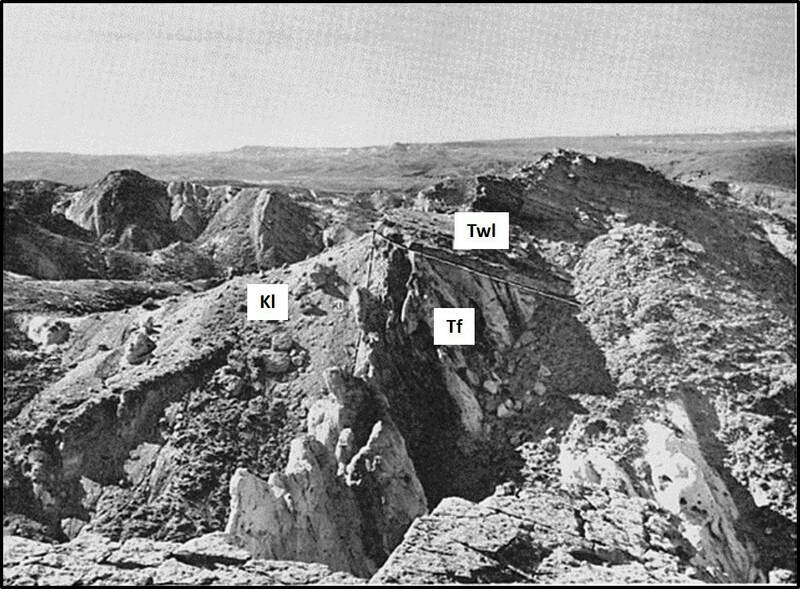 and Berg, C.R., 1985, Seismic Interpretation of the Casper Arch, Tepee Flats Field, Wyoming, in Gries, R.R and Berg, C.R., Seismic Exploration of the Rocky Mountains: Rocky Mountain Association of Geologist and Denver Geophysical Society, Fig. 6, p. 55, and Fig. 2, p. 52. ​At Hells Half Acre the folding generated by movement of the Laramide age (about 60-55 million years ago) Casper Arch thrust can be observed at the east edge of the erosional gorge. 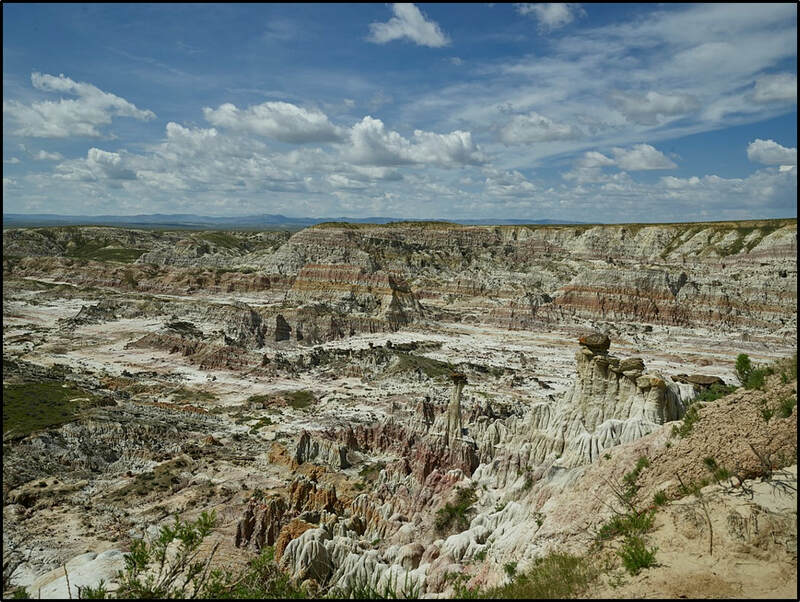 The angular unconformity between the Eocene Wind River Formation and the Paleocene and Mesozoic beds marks a period of major uplift on the fault. 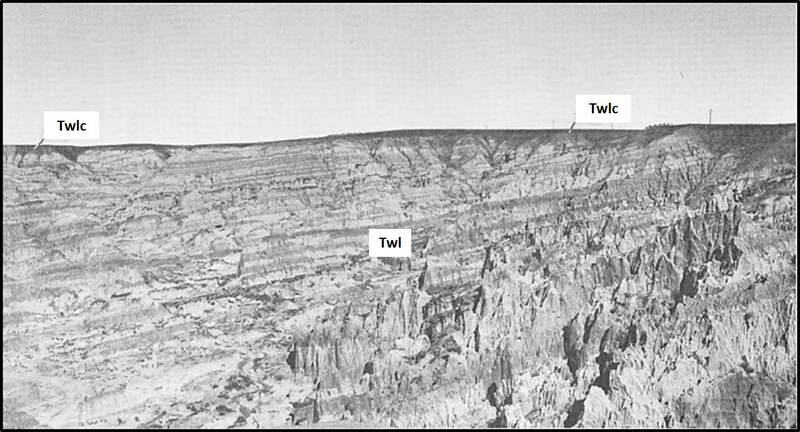 The Wind River Formation was shed from the uplift. The badlands landscape of Hells Half Acre developed by erosion over the last few million years. Although this tourist attraction is closed, and the county fenced off the site, it is still worth a stop to see the geologic oddity of Hells Half Acre, the folding created by uplift of the Casper Arch and perhaps a disgruntled Arachnid.